Icon of Christ the Bridegroom, sitting above the star at Golgotha in the Church of the Holy Sepulchre, Jerusalem. Holy Tuesday or Great and Holy Tuesday (Greek: Μεγάλη Τρίτη, Megale Trite) is the Tuesday of Holy Week, which precedes the commemoration of the death of Jesus. In the Roman Catholic Church, the readings are Isaiah 49:1-6; Psalm 71:1-6, 71:15, 71:17; 1 Corinthians 1:18-31; and John 13:21-33, 13:36-38. In the Revised Common Lectionary, which is used by the Anglican Communion, Methodist Churches, Lutheran Churches, Old Catholic Churches and Reformed Churches, the Scripture lessons are Isaiah 49:1-7 (First Reading), 71:1-14 (Psalm), 1 Corinthians 1:18-31 (Second Reading), and 12:20-36 (Gospel Reading). 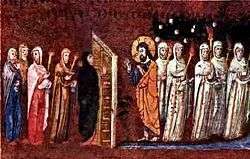 The Wise and Foolish Virgins (from the Rossano Gospels). In the Eastern Orthodox Church, Armenian Apostolic church and those Eastern Catholic Churches that follow the Byzantine Rite, this day is referred to as Great and Holy Tuesday, or Great Tuesday. On this day the Church commemorates the Parable of the Ten Virgins (Matthew 25:1-13), which forms one of the themes of the first three days of Holy Week, with its teaching about vigilance, and Christ as the Bridegroom. The bridal chamber is used as a symbol not only of the Tomb of Christ, but also of the blessed state of the saved on the Day of Judgement. The theme of the Parable of the Talents (Matthew 25:14-30) is also developed in the hymns of this day. The day begins liturgically with Vespers on the afternoon of Great Monday, repeating some of the same stichera (hymns) from the night before. At Great Compline a triode (Canon composed of three Odes), written by St. Andrew of Crete is chanted. The Matins service for Monday through Wednesday of Holy Week is known as the Bridegroom Service or Bridegroom Prayer, because of their theme of Christ as the Bridegroom of the Church, a theme movingly expressed in the troparion that is solemnly chanted during them. On these days, an icon of "Christ the Bridegroom" is placed on an analogion in the center of the temple, portraying Jesus wearing the purple robe of mockery and crowned with a crown of thorns (see Instruments of the Passion). These Matins services are often chanted the evening before so more of the faithful may attend. The Matins Gospel read on this day is from the Gospel of Matthew 22:15-23:39. At the Liturgy of the Presanctified Gifts, some of the stichera from the previous night's Matins (Lauds and the Aposticha) are repeated at Lord, I have cried (see Vespers). There are two Old Testament readings: Exodus 2:5-10 and Job 1:13-22. There is no Epistle reading, but there is a Gospel reading from Matthew 24:36-26:2. ↑ Holmes, Stephen Mark (1 October 2012). The Fathers on the Sunday Gospels. Liturgical Press. p. 22. ISBN 9780814635100. The Revised Common Lectionary has been subsequently adopted by many English-speaking Protestant denominations such as the Church of Scotland and various Methodist, Lutheran and Reformed Churches. It has also been adopted by some Old Catholic Churches and is widely used throughout the Anglican Communion, for example by the Church of Ireland, Scottish Episcopal Church, Church in Wales the Episcopal Church (USA) and the Anglican Churches of Canada, Australia, Aotearoa/New Zealand and Polynesia, Melanesia, the West Indies, Central Africa, and Southern Africa. In the Church of England the two-year Sunday Lectionary of the Alternative Service Book 1980 was replaced in 2000 by an adapted version of the Revised Common Lectionary in Common Worship. 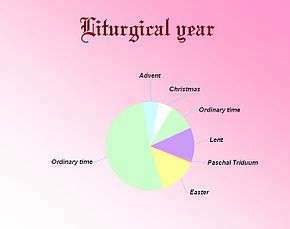 ↑ "Year A - Holy Week : Revised Common Lectionary". Vanderbilt University Divinity School. Retrieved 22 March 2016.